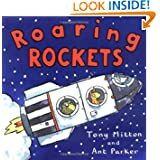 A couple weeks ago, we read lots of good books about two topics that I thought would be of interest to Jonathan: rockets and robots! This was a fun board book that Jonathan really liked. It features moving gears and parts to show how robots work. It's very clever and very appealing to toddlers. We checked our copy out from our local library and the only drawback was the moving parts definitely showed some wear. However, this is a wonderful book for robot-loving toddlers and preschoolers. This was probably Jonathan's favorite book. 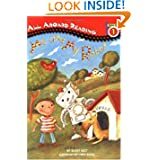 It's an early reader about a young boy Reese and his robot who try to find a friend's missing kitten. It has just enough humor that made Jonathan laugh. He requested it several times. 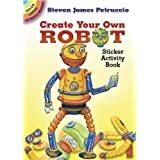 This isn't a storybook, but an activity book that features a robot body and enough parts (stickers) to make four different robots. 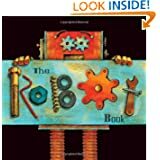 Jonathan loved this book and kept wanting to pull it out and build new robots. It was a pretty big hit and was very affordable fun! 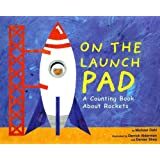 This is a cute concept book in which you and your children count down from 12 to 1 in preparation for a rocket launch. The illustrations are bold and each page has a hidden number to find. Jonathan had fun counting the objects, but wasn't as interested in finding the number. Still, it's a good concept book for any rocket-loving little boy and a wonderful addition to a space unit. Ah, Tony Mitton. How we love his books, especially his Amazing Machines series. Ant Parker's bold pictures are a wonderful complement to Mitton's rhyming verse. This book teaches about rockets and astronauts in a way that's fun and educational. Jonathan always asks for repeated reads of these books and Roaring Rockets was no exception. This board book is an excerpt from one of the original George books. Jonathan really enjoyed Curious George when we went through our monkeys unit and I thought that Grace might like the shortened board book. The story was still too long for Grace to enjoy, but Jonathan liked reading the shortened story. This is an informative easy reader about space. 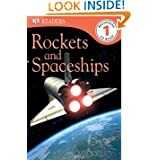 It has photographs on each page showing rockets, spaceships, and astronauts and teaches about space travel. Unfortunately, this one didn't really interest Jonathan. He hasn't really developed a strong interest in outer space at this point. 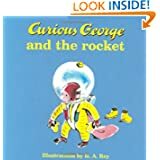 If your little one is very interested in space, astronauts and rockets, this would be a good book to try! This was in the middle of potty training and days where Jonathan was lukewarm about the activities I presented. Some things went really well, and others were a complete bomb. But, if you're looking for some ideas on these topics, check out my Pinterest boards on rockets and robots! 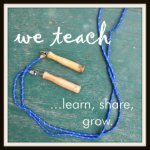 I've been enjoying reading your blog! So we started "home preschool" this fall and Robots was our first unit. We read SEVERAL of the books you mention! I love it. We also got the robot building sticker book. How fun. I'm going to check out your Pinterest boards too! Thanks for the book recommendations!! My boys love rockets and robots! I'm sure I'll be forced to do some kind of theme with theme soon! My daughter definitely loved all Milton books too when she was younger, and she loves space books. Thanks for joining WMCIR!